"This recipe is in great demand from my friends and family. It tastes similar to sweet potato souffle, with a custard-like texture. Use with any meal that sweet potatoes seem to go with (for example, ham, pork, etc). Yum yum!" Put butternut squash in the microwave and cook on high, until soft, 2 to 3 minutes. Cut in half, scoop out seeds and cube. Bring a large pot of water to a boil. Add squash and cook until tender, about 15 minutes. Drain and mash. 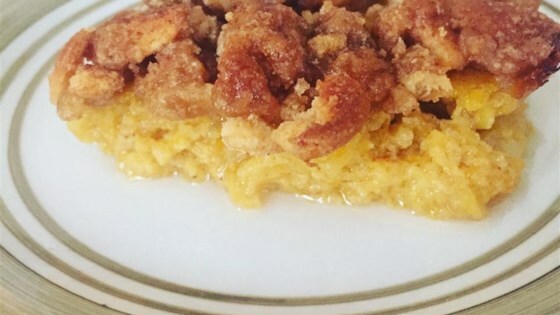 In a 9x13 inch casserole dish combine 3 cups mashed butternut squash, white sugar, milk, vanilla extract, salt, flour, eggs and 1/4 cup melted margarine. Bake in preheated oven for 45 minutes, or until set. In a medium bowl, combine crushed vanilla wafers, 1/2 cup melted margarine and brown sugar. Crumble over top of cooked casserole and return to oven to brown. A creamy squash casserole with a custard-like texture and crunchy topping.